I gave the Red Amaryllis Bulb Kits as Christmas gifts and kept one kit. It is very nice and my recipients of the gifts have been very pleased with it, also. Lovely gift to give to a gardener friend. Nice sized good quality healthy looking bulb and cute pot and soil included so all you have to do is add water and give it sun and you're done. Very lovely colored bloom. One of my favorites even if it is a smaller sized variety. Got 3 different amaryllis from Holland Bulbs and although they have not bloomed yet they are growing and have put up bloom buds and we await the blooms with bated breath. We've always had good luck with Holland Bulbs. 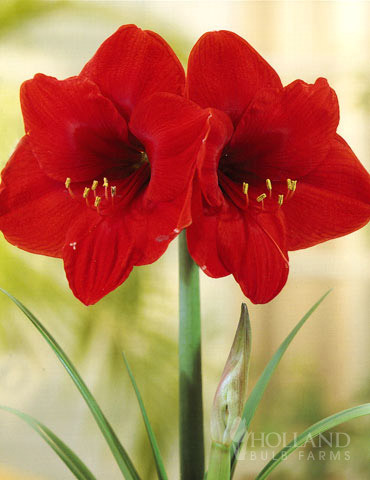 I ordered 2 Amaryllis bulbs for my daughters in Tampa and Napa. Since the weather at the shipping location was so frigid at the time, I was notified that shipping would be delayed a few days until the temperature improved. I was thankful to be notified. Both daughters received their bulbs soon after shipping. Their bulbs are growing quickly and are very healthy. I will definitely purchase from Holland Bulb Farms again.